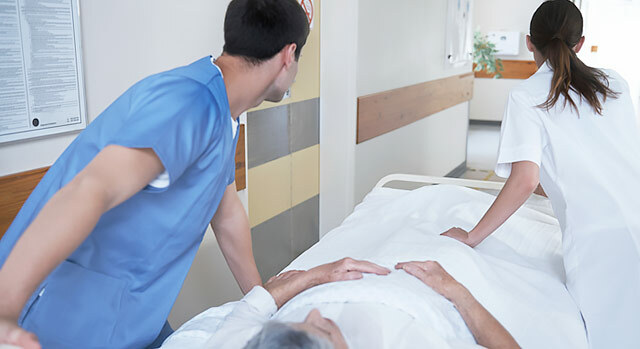 Sudden illness or injury can occur without warning, and while no one typically plans a trip to the Emergency Department, everyone should know what to expect after they arrive. The Emergency Department (ED) at St. Mary’s Regional Medical Center provides urgent care to patients who have traumatic injury, major illnesses or other issues that require immediate treatment. The staff includes physicians, nurses and other healthcare professionals who follow specific procedures so that you can get the care you need as quickly as possible. Following are the five steps to expect when you arrive at the St. Mary's Regional ED. Triage is the process of determining the severity of a patient’s condition. Patients with the most severe emergencies receive immediate treatment. That is why some patients may receive medical care before you, even if they arrived at the ED after you. When you arrive at the ED, emergency technicians determine the reason for your visit. A registered nurse will take your medical history and perform a brief examination of your symptoms. The triage registered nurse might assign you a priority level based on your medical history and current condition according to the following scale: Level 1 – Resuscitation (immediate life-saving intervention); Level 2 – Emergency; Level 3 – Urgent; Level 4 – Semi-urgent; Level 5 – Non-urgent. In some cases, an emergency registered nurse may start diagnostic testing to decrease the time spent waiting for medical treatment. Should your symptoms worsen as you wait, notify the emergency technician or triage nurse immediately. Every patient who comes to the Emergency Department at St. Mary’s Regional receives treatment from an attending physician or mid-level practitioner. Depending on your condition, a registered nurse may start an intravenous (IV) line. The IV line will allow the nursing staff to quickly adminsiter medications or fluids that may be ordered by a physician. A nurse or technician may also take blood or urine samples, or they may send you for an X-ray or other imaging test before a physician sees you. Physicians may also order blood tests on an urgent basis. Test results help emergency medicine physicians assess your condition. The results could be available within one to two hours, while you are in the ED. However, some test results may require a longer wait. During your treatment, the staff in the ED will help make sure you are comfortable and informed. An ED physician or mid-level practitioner will reevaluate your condition after they receive your test results because the results may give them additional insight into the type of treatment you need. You know your body. How you feel can be just as important as your test results, so be sure to let physicians or nurses know about any pain or discomfort you may feel. The staff may also contact your personal physician for additional information. If you do not have a personal physician, we may refer you to an on-call physician. After your reevaluation, the attending physician determines whether you should be admitted to the hospital or treated and sent home. Part of our job is to keep you healthy long after you’ve left the ED. All patients receive written home-care instructions to follow when discharged. The instructions describe how you can safely care for your wound or illness, directions for your prescribed medications and recommendations for follow-up medical care. It is important to fully understand all instructions. If you have a question – let us know while you’re here. Or call 580-249-3001 once you return home. Be sure to follow up with your personal or referred physician as well. One to two weeks after your visit to the Emergency Department at St. Mary’s Regional Medical Center, you may receive a phone call asking for your opinions about your stay. Your comments allow us to continually provide outstanding emergency care to all our patients. If you were discharged from the ED to your home and do not understand the instructions you received for follow-up care, please call us at 580-249-3001 and we will be happy to review the instructions with you.